When Autumn hits Boston, it’s time to visit the local farms for a fun-filled and delicious day of apple picking. There are dozens and dozens of farms throughout the area and each offers many different varieties of apples to pick. Boston Hill Farm, located on Route 114 in North Andover, is a great place to take the kids – they offer daily hayrides in and out to the apple orchard and their pumpkin patch. They also have a well-loved fall festival every weekend through the end of October featuring BBQ chicken and ribs, live music, fresh fruits and other fun activities for the family. Numerous other family activities are also taking place in farms around Boston so do your research to make the most of your visit. The breeze is refreshing and the leaves are bright and colorful; it’s a great time of year to visit Walden Pond. Walden Pond in Concord is the location where Henry David Thoreau lived for two years, gathering insight and inspiration to write his famed work Walden or Life in the Woods. A National Historical Landmark, Walden Pond is a state reservation that encompasses 335 acres of protected open space. Hike the wooded trails that frame the pond and witness the beauty of the 102-foot deep glacial kettle-hole pond. Enjoy a guided walk, an afternoon of fishing or canoeing and take a tour through the replica of Thoreau’s one-room cabin. There are also various interpretive programs year round, a gift shop and a bookstore. The two and a half mile trek isn’t arduous, especially in the fall when everyone wants to be outside and breathe in the fresh autumn air. The pretty brick-lined route will lead you to sixteen of the most important historic sites around the city and you can do it on your own or with a guide. Each day, hundreds of visitors walk the trail, witnessing the Boston Common, the Old North Church, the Site of the Boston Massacre, the Old State House, the Paul Revere House, the Bunker Hill Monument and a lot more. You can start the tour at any point along the route and it makes for a fun history lesson for children and their parents. 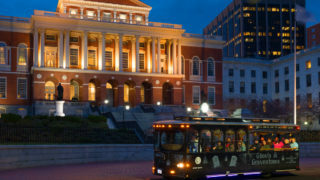 Hop on the city’s most well known sightseeing tour to see the best of Boston’s historical icons and attractions. The Old Town Trolley Tour is the most comprehensive tour of its kind, taking you to more than 100 different points of interest. The hometown guides are amusing and eager; so don’t expect a monotoned description of quick drive-bys. These history buffs share interesting accounts about the people and places that have shaped Boston’s history. Get off and on all day and stay as long as you want at Faneuil Hall, the Old State House, Park Street Church, the Granary Burying Ground, Boston Common and much more. If you’re looking to walk the Freedom Trail, get off at stop 14 and start there. There are trolleys running all day so you can catch another one anytime. If you’ve brought the kids along, get off at stop 16 to visit the Boston Tea Party Ships and Museum and the Boston Children’s Museum, both within walking distance. At the Boston Tea Party Ships & Museum, you and the family will learn everything you ever wanted to know about the Boston Tea Party because you’ll be thrown into the action. This multi-sensory Boston museum offers you all a chance to march alongside the patriots and throw tea overboard just as they did centuries ago. You’ll walk through an authentically restored tea ship, see one of the only two tea chests left in existence and experience holographic technology that will transport you back to colonial Boston. Be sure to stop in for a spot of tea and a scone in Abigail’s Tea Room. The weather is cooler, the leaves are changing…and the haunts are darker. You may have learned a thing or two about the American Revolution while touring Boston’s museums, but we can guarantee you haven’t learned about the Lady in Black. Board the Trolley of the Doomed with Ghosts & Gravestones to uncover the eerie side of Boston’s history. Walk among the dead at King’s Chapel Burying Ground, pass by the Omni Parker House hotel and hear the tales that have plagued this historic city for 400 years. Held at Christopher Columbus Waterfront Park, Boston’s Arts Festival includes a covered artists’ village, two stages of performing arts, and family activities. Play video games, tabletop games, and role-playing games at Boston Festival of Indie Games, which also hosts films and lectures for game developers and game jams for making your own games. Celebrating the incredible musicians of Jamaica Plain, JP music festival has two stages of music by 20 local artists and bands, plus food trucks and children’s activities. Watch brass bands, vintage cars, military units and politicians go south on Bennington Street from the parking lot at Suffolk Downs to Maverick Square where there will be an after party. Top chefs create Gingerbread masterpieces to be judged, several vendors will be selling one-of-a-kind Christmas gifts, and all-you-can-buy holiday decorations! This event is not entirely free, admission is $15 and kids under 14 are free. Watch high-energy dancing by teams in colorful costumes at Boston Bhangra Competition at Orpheum Theatre.